Montmartre is full of unique boutiques and respected branded stores like American Apparel. Rue des Abbesses is dotted with a number of the finest shopping in Paris so do spend time wandering along this road as you pick up several things to French-up your wardrobe. Window shopping is also fine and you'll have plenty of stylish window displays to catch your interest. Note that in France, it's courteous to pronounce your entry and departure in a shop. A simple 'Bonjour' when you arrive and 'Merci, au revoir' is looked upon as a sign of politeness, though you won't necessarily get a response. Spend a while checking out the shops along this road, the fromagerie (cheese store), the fruit shop, specialty jam store and Jeff de Bruges Belgian chocolate store are all worth a visit. Halfway along Rue Lepic you will find the cafe Les Deux Moulins. Les Deux Moulins Les Deux Moulins, or Two Windmills, is a rather famous cafe in Montmartre, thanks to the French film Amelie. This is actually the cafe where she works during the movie. Though there are lots of pictures and memorabilia on display to remind you about the past, Amelie doesn't in fact work here. But it's always fun to order a chocolate cake and a hot drink here and be whisked away into our celluloid dreams of Amelie. Le Moulin Rouge In Belle Epoque Paris, the Moulin Rouge cabaret was established in 1889 - the same year as the Eiffel Tower. Back then, a show used to cost 50 centimes. The shows are expensive: around 90 euros, so only go if you really want to see the historic birth place of French cabaret. It's not just a tourist trap: the shows are actually very good with solid performances. There are two sessions nightly: one at 9pm and one at 11pm. Shows at the Moulin Rouge need to be arranged ahead of time to make sure to get seats. This is often performed online via their website. Walk up Rue Girardon and turn right onto Rue de L'Abreuvoir. When you head up this road you'll find a curious pink building on the left hand side. This building is aptly named Maison Rose, a fine Montmartre establishment frequented by Van Gogh. He was a huge fan, largely because he could grab a meal on the bottom floor, then head upstairs and select between the ladies in waiting. Nowadays, they only serve food. 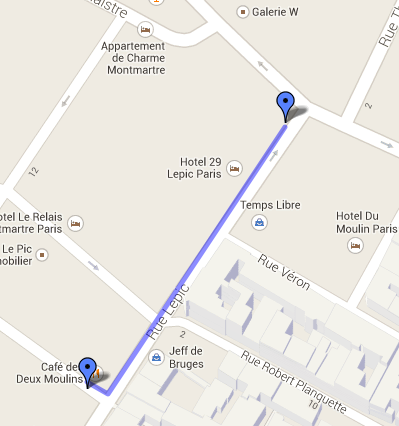 Turn left onto Rue des Saules and continue down before you reach the Lapin Agile on the right hand side of the road. The Lapin Agile, or agile rabbit, used to be known by way of an alternative name - The Assassins. Since you can imagine that wasn't great for company so the owner requested painter Andre Gill, to paint him a mascot - the rabbit which is still visible today. The place then became known as Gill's rabbit (in French, it's known as the Lapin a Gill). Over time this became contracted to Au Lapin Agile. Picasso used to come here when he was still a struggling artist who'd swap paintings for food. Nowadays, you're able to view a cabaret here, but it's rather different compared to the cabaret of the Moulin Rouge: there's less skimpily-clad females and more females that sing French cabaret songs. Admittance fee for the Lapin Agile costs around 20EUR.